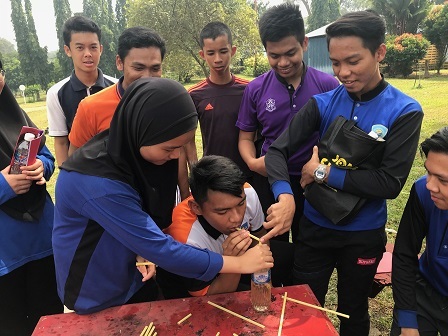 SERDANG – A total of 174 students from 11 secondary schools in the Federal Territory of Putrajaya participated in Physics 4 U Camp 2018, a programme designed to nurture interest and improve students’ performance in Physics, recently. 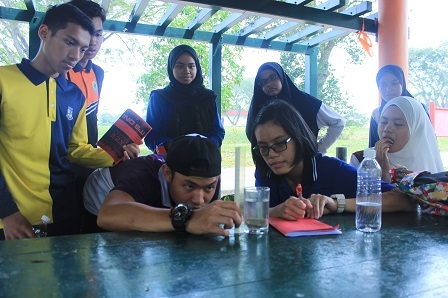 The programme was organised by Universiti Putra Malaysia (UPM) through its Putra Outreach Physics team in collaboration with the Science and Mathematics Unit of the Education Department of the Federal Territory of Putrajaya and the Physics committees of secondary schools in Putrajaya. The idea for the programme came from the Putra Outreach Physics team leader, Dr. Yap Wing Fen, who is also a senior lecturer at the Physics Department, Science Faculty, UPM. He was assisted by 34 members of the UPM Science Faculty Physics Undergraduate Club, and the Physics committees of all schools in Putrajaya, led by Mohd Fahmi Junaidi. According to Dr. Yap, research showed that on average, secondary school students viewed Physics as being too complicated with too many concepts to learn. “By assuming Physics as a way of life and practise it, it will be easier for these school students to understand a concept, and as a result, they will excel in Physics in Sijil Pelajaran Malaysia (SPM),” he said. The motto of Putra Outreach Physics, “Transfer, Transverse, Transform” focuses on the implementation of a hands-on approach. Participants were given opportunities to watch, experience and learn concepts that occur in daily life as well as participate in outdoor activities. One of the activities held was “The Amazing Race” which combined physical fitness and analytical thinking to solve Physics problems at experiment stations. The Dean of the Science Faculty, UPM, Prof. Dr. Mohd Basyarudin, said the programme enhanced the soft skills of UPM facilitators from the Bachelor of Science (Honours) programme with regard to their communication, teamwork, lifelong learning, information management, critical thinking and problem solving skills. He said that the programme was able to produce undergraduates with a high level of awareness and responsibility towards the local community and the society. The representative of the facilitators, Muhammad Ahnaf Sharifulazman, a Year 3 undergraduate student of the Bachelor of Science (Honours) programme in Instrumentation Science of the Physics Department, said through the programme, facilitators were able to deliver knowledge and help students to understand the concepts of Physics correctly. A participant, Muhammad Arif Musthaba from SMKA Putrajaya, said that the programme instilled participants’ interest through dynamic learning. “This programme also increases participants’ productivity through activities that encourage teamwork spirit. My perception towards Physics has changed after joining this programme. Thank you to all the facilitators and Dr. Yap,” he said.